I watched a live feed yesterday of Jay Rogers the CEO of our home team Local Motors talking to President Obama about the LM Darpa project vehicle, the XC2V. As I texted Jay a congratulatory word it was a moment of real awareness for me about what Jay has accomplished with the Local Motors team. Jay has always been an enthusiastic proponent of his new company(at 4 years old though they are starting to look like veteran car guys now). He has faced the challenges of starting a car based company in the midst of the chaos that we call the modern business climate. He has managed to raise millions in investor money with a clear and compelling value story. If I showed you the list of investors in LM you would be impressed not by their big names(there are a few) but by the sheer bulk of business experience he has been able to "rally" for the Local Motors launch. Photo ops are just that...opportunities to shine. And both Jay and the LM Darpa vehicle did a great job highlighting what a nimble and talented team in a small manufacturing company can do for this country. To recap, DARPA approached LM to test the crowd sourcing methods and concept development in vehicle manufacture that Jay and Local Motors invented. 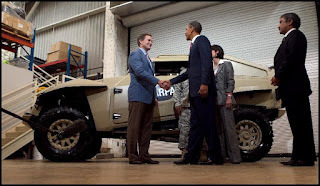 They gave LM 6 months to design and build the army's next fast extract vehicle...Jay showed up early in Washington to meet Obama after the prototype car drove to DC from Phoenix. On time, under budget and ready to pull our troops out of a bad place at 120mph safely. Well done. When I posted the picture and video of Obama on facebook I also had a few critics....hey, its the wild west when you communicate publicly after all, and I am now very used to it...but I was surprised at one of my friends' tough take on Obama and Local Motors. Look, I voted for the other guy last election, no hard feelings here, the people have spoken. But even a republican like me thinks it is not just a little kind of cool when the company you helped co-found, and your good friend and CEO of that company, is held forth as everything right in American innovation. My facebook pal couldn't see past the millions it took to launch a class company...go figure. Now this guy has built a bunch of factory five cars over the years and is the definition of a passionate and loyal customer of mine.....so why the anti Obama/LM vibe? I will chalk it up to the difference between the frugal Smyth/FFR business model and the more expensive and sophisticated business model at Local Motors. Jay spends real money going after aggressive business goals, and that makes some people nervous when you compare the cash burn to a cash based mature company like FFR. Growing with cash and retained earnings won't let you explode in growth...only relatively large cash infusions will let you do that. In my personal world of new products I work as the R&D guy with budgets under a million per project...most often funded by yours truly. It is what I know, I have a bit of a following in people who respect my machine making abilities and creativity, and I am rewarded with being able to sell a few interesting projects to the marketplace in the form of car kits. I am one step above a back yard hot rod builder...a few more tools and resources in the way of computers and design capabilities....but still fairly dependent on my own skills. That is what started FFR and it is what started Smyth Performance....it is definitely not what started Local Motors. Jay started by raising money and forming strategic partnerships into what is becoming a world beating organization. At least that is the goal. After meeting with Jay for a feverish few months while he was finishing Harvard business school, I worked with the last of my influence and whatever informal clout I had left to convince Factory Five to invest our valuable car design expertise in Jay and Local Motors four years ago. It was worth it to push very hard for the deal. Guys like Jay just don't arrive at your doorstep that often, if ever. I believed in Jay and wanted two of our young engineers to help him next door and take the company wherever he wanted to go. The talent that Jay assembled and the team of investors was amazing. His ability to refine the LM story over the first years combined with a skilled car and web team has delivered real results creating both a vehicle and a community of designers. This allows Jay to continue to raise millions in capital as he needs it. To Dave's credit, he finally went along with the deal and Local Motors was born. Jay quickly raised a million or two in that first round and he was off and running with a little building and two talented engineers that had cut their teeth in the FFR kit car design world...off he went at a rate that we could never envision since we just never had access to that kind of investor base. This is not how we do things at Smyth Performance or Factory Five. You either want a big piece of a small company(the driving force behind FFR and Smyth) or you want a smaller piece of a big company(LM high growth strategy). LM has a chance to be a scalable and significant company that can make a difference in the world of product development. Will they make it? Maybe my pessimistic friend on facebook is right and it will fail in a few years and the millions invested will be lost.....but a fairly large group of sophisticated investors are voting with their money on the opposite story...one of real and sustainable growth. Time will tell of course, but I have learned that you never bet against smart guys like Jay that are executing to a plan...ever. I know where I have placed my bet and participating in this fun and serious game is more rewarding than the financial or business risk. So when I look at the founder page in the Local Motors corporate documents, I can't help but smile at the story behind the three names. Jay Rogers, Jeff Jones(his HBS class project partner) and Factory Five Racing. The story of the start-up I will write with Jay's blessing someday since it is mostly his story to tell, but for now....congratulations on a very public small business victory Jay, and great work Local Motors. We all share President Obama's view that you are leading a terrific effort to change the way products are designed and made. Mark, I agree that this is a great news, and yes, I voted for the other guy as well. Our country has a President, and there are many ways of throwing our political views at every story. There are however, stories that would get spotlight, no matter who was elected (Bin Laden for example). These stories have little to do who's in office, but more on the fact of what the subject has accomplished. I believe that everyone agrees that better, cheaper and faster is a win-win for all, as long as quality meets satisfactory or specified standards. Kudos to Local Motors for what they have done, and where they are headed! Mark, well put. Im not a fan of Obama, or politics at all for that matter. But what local motors has done in the last 4 years is very impressive. This was also done, while this economy has been in the dumpster as well. Looking forward to more of your blog postings.